Despite them being highly recommended by friends, I’d never taken a walking tour with Context Travel. 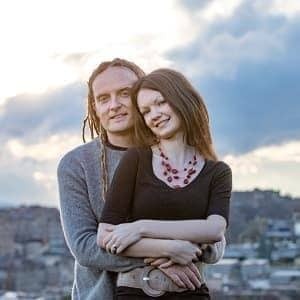 Until, that is, our recent trip to Italy, where as well as having a wedding ceremony in Venice, we also took a number of walking tours with them, in Venice, Rome, and Florence. Context is a fairly specialist walking tour company. First, their group tours are remarkably small, no more than six people. In fact, on the five tours we took, there were never more than four of us. That’s pretty intimate stuff. Second, the tours are, and I mean this in the most positive way, seriously geeky. They’re not your standard “welcome to London, here are the highlights” sort of thing. 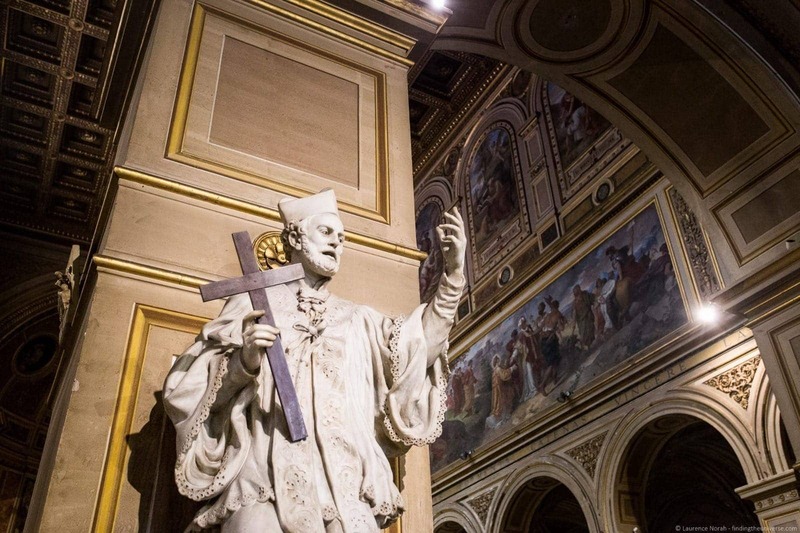 Each tour is very detailed, focusing usually on a specific theme, with the guide, or “docent”, being a highly qualified expert wielding a masters or doctorate degree relevant to the subject of the tour. Basically, you are going to have your mind blown with some serious, in-depth knowledge, focused around a specific subject. The tours are aimed at people who are looking for something a little different to a standard tour, who want an in-depth understanding of the subject, and are intellecturally curious about the topic in question. This definitely describes Jess. But what about me? Let’s look at the tour we did to answer that question. 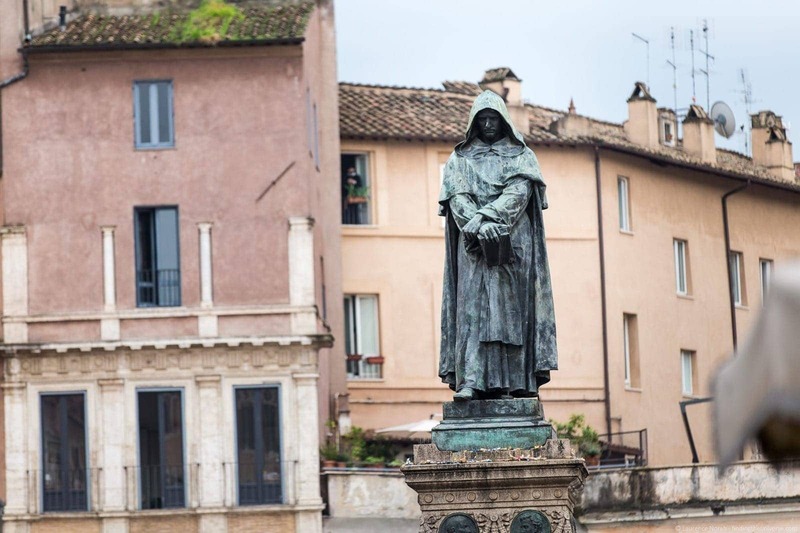 The three hour long “Popes, Power and Parties” tour focuses on a period in Rome’s history during the Renaissance, from around the 16th through to the 18th centuries, with particular focus on the 1500’s. 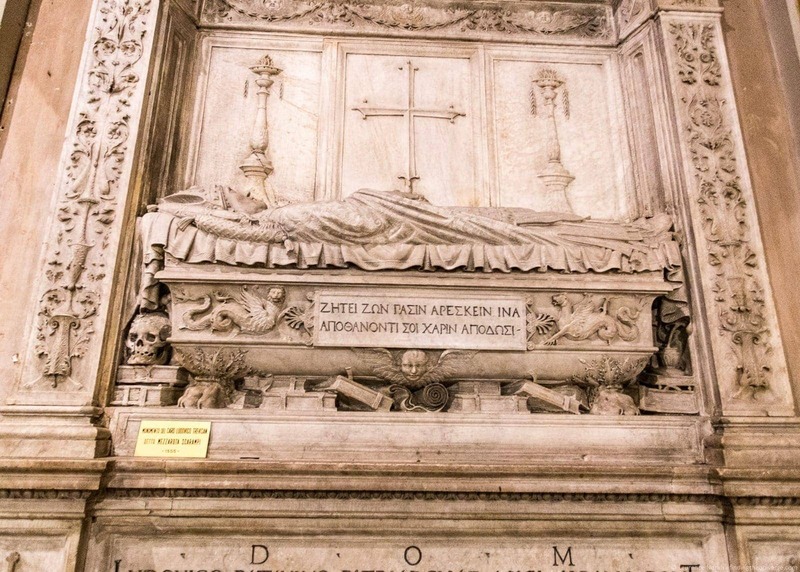 This was a time when enormously wealthy and powerful European families came to Rome, and spent piles of cash building somewhat extravagant palaces, throwing gigantic parties and of course, amassing power, ultimately vying for that ultimate throne at the time – the Papal seat. Basically, Rome at that time was a bit like Game of Thrones, with less dragons and bloodshed, but just as much political intrigue and plotting. 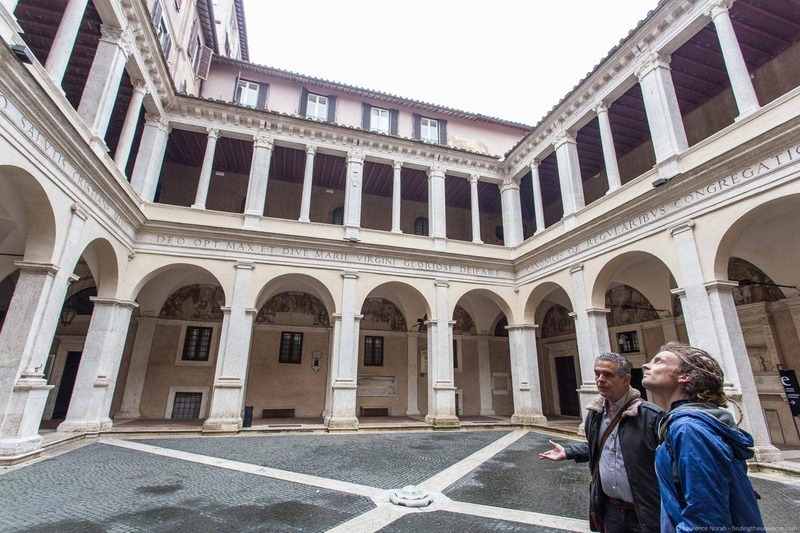 Our tour started in the Piazza Farnese, where we met our guide, Jose Grave de Peralta, holder of a master’s degree in art and Spanish literature, and a full time resident of the city of Rome. It was raining a bit, which wasn’t a wonderful way to start the tour, but Jose was warm and friendly, and it turned out that we were the only two people on the tour, which was nice. At this point it quickly became clear how Context differ from other tours I’ve taken. The guide took his time to ask us about our backgrounds and interests, so as to be sure that our walk would best reflect what we wanted to see and learn about. I thought this might be because there was just the two of us, but even on the other Context tours we took, with more people, the guide did their best to learn about what everyone was intersested in, so as to try and get the most out of the tour for everyone involved. As our guide deemed we were young and fit, he planned out a route to encompass a good number of sights that fell under the theme of the tour. 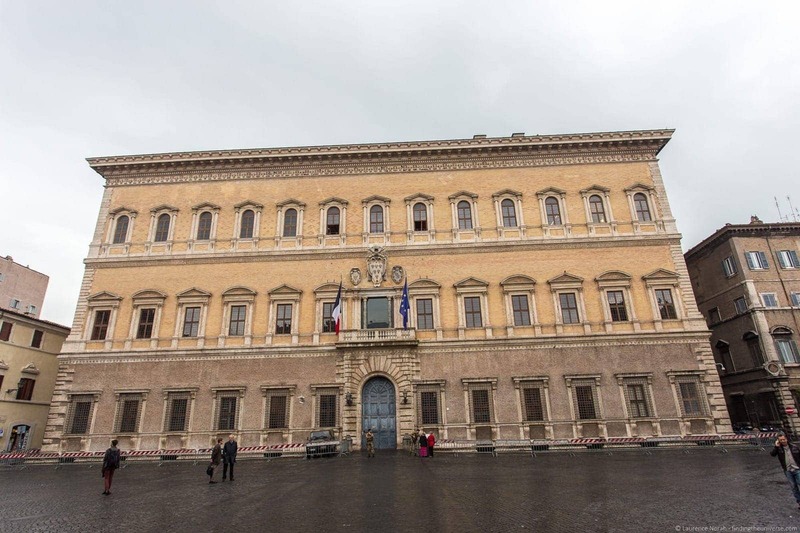 We started off in Piazza Farnese, the tour meeting point, which is home to the Palace of the Farnese family. 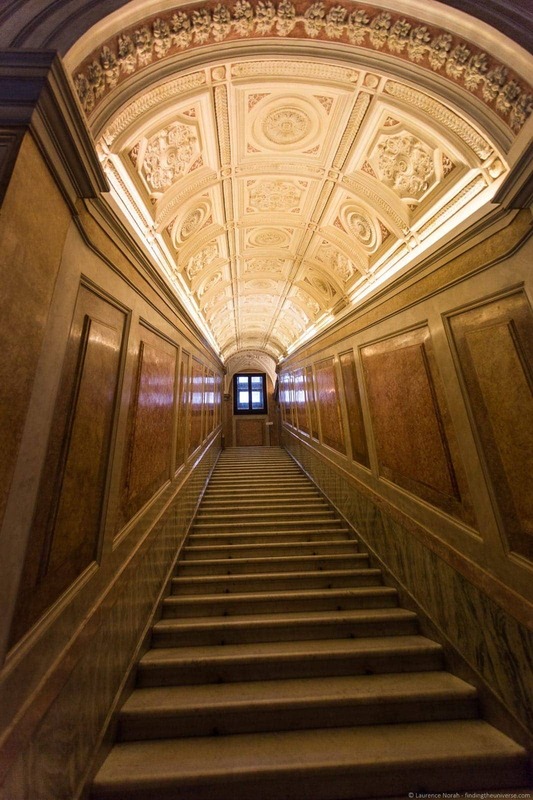 The Palazzo Farnese is an impressive 16th century palace and one of the most importatnt palazzos built in Italy during the High Renaissance period, employing artists and architects such as Michelangelo and Giacomo della Porta. The Farnese were one of the most powerful families of the time, and one doing well with the game of papal thrones, with Pope Paul III being a Farnese. More on the Farnese family later. From Piazza Farnese we took a short walk to the stunning Basilica Parrocchiale S. Lorenzo in Damaso. This is a really beautiful church that doesn’t get very many visitors, partly because it looks very little like a church from the outside. It’s worth popping in to though, as it’s full of gorgeous artworks, including sculptures and frescoes. Jose’s passion for his subject really started to shine through in here, as he spoke to us about the various power struggles in Rome over the centuries, and how this affected the architecture and art of the city, with each figure in history keen to leave a lasting legacy in the form of buildings and art. 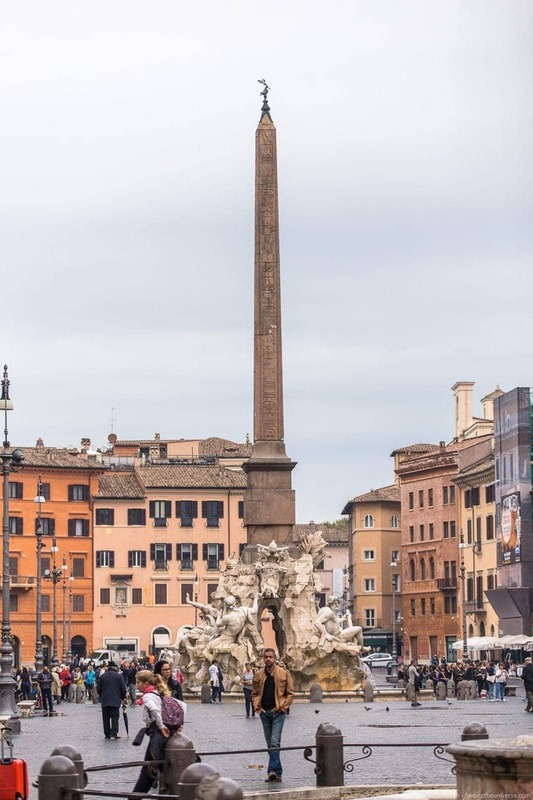 Beyond the Basilica, our tour continued on through the Piazza Navona, home to the incredible Fontana dei Quattro Fiumi by Bernini. This fountain was designed for the Pamphili family, who happened to both own the main Palace on the square at the time, and have one of their chaps as Pope – Pope Innocent X, who commissioned the project. This is a stunning Piazza, which should be on every visitor’s Rome itinerary. 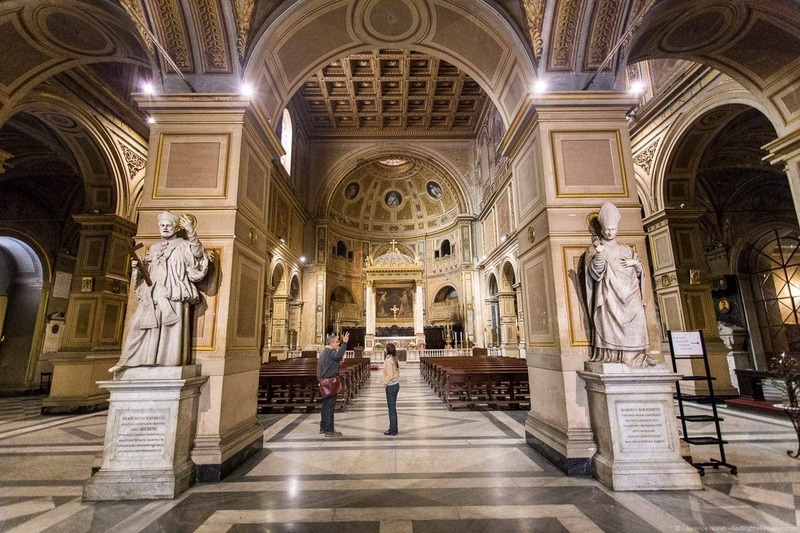 From the Piazza it was on to more churches, including Santa Maria della Pace, an octagonal building whose facade was commissioned by Pope Alexander VII, successor to Pope Innocent X, and a member of the powerful Chigi family. Contained within are a series of stunning frescoes by Raphael, commissioned by an earlier member of the Chigi family, who happened to be Pope Julius II’s personal banker. You can actually have a coffee or drink here at the on-site cafe to either admire the Raphaels or to sit outside in the cloisters. 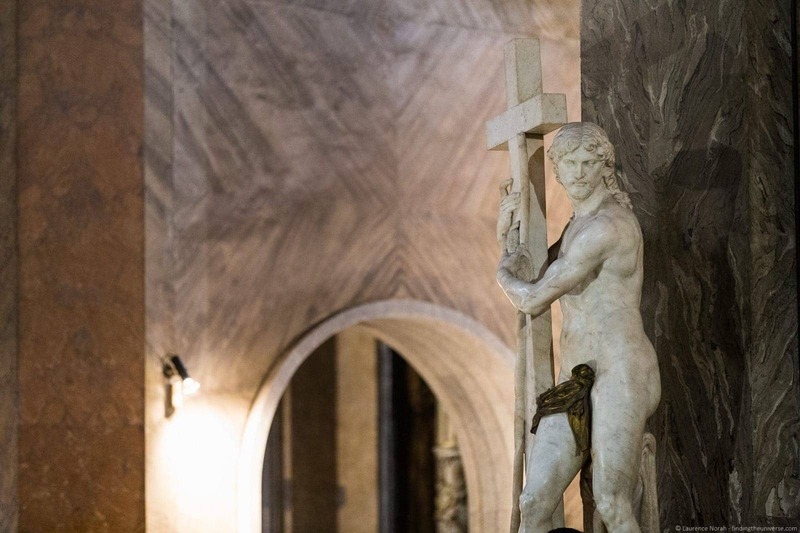 We also dropped in to the Basilica di Santa Maria Sopra Minerva, tucked away behind the Pantheon, which happens to have a Michelangelo sitting next to the altar. As you do. 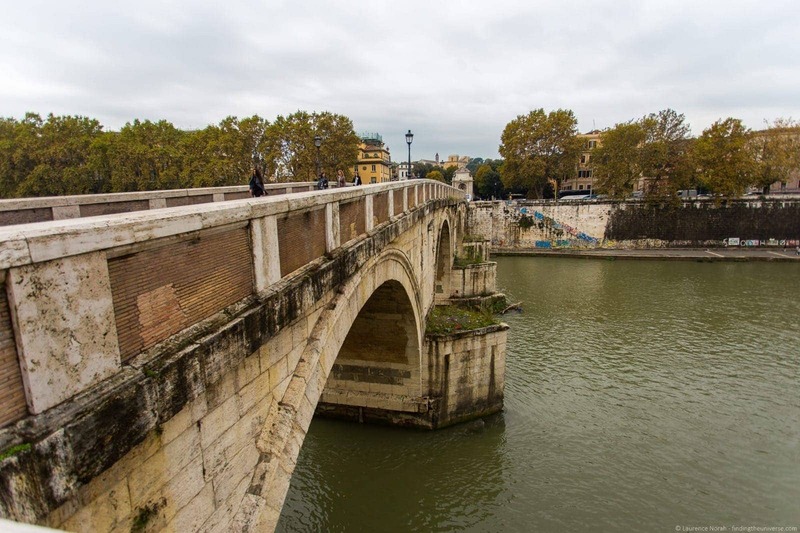 From this area of Rome we hopped into a taxi and drove to the Ponte Sisto, to start the second half of our Renaissance journey. 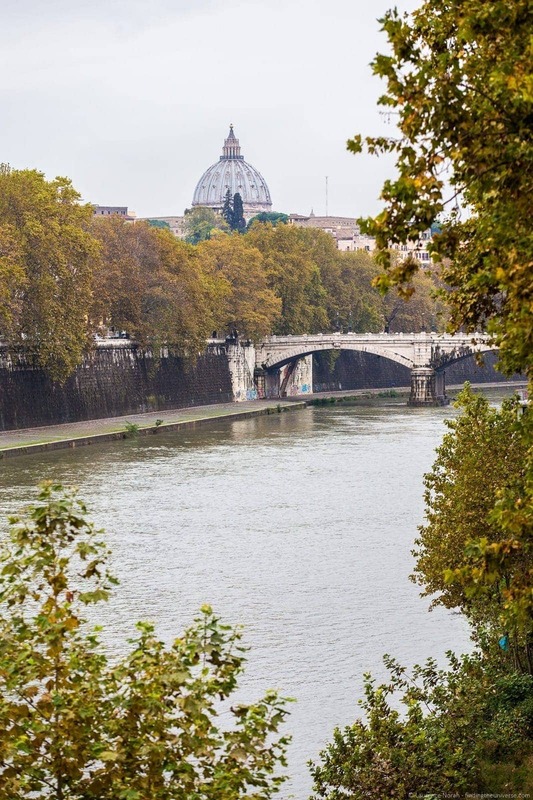 The Ponte Sisto is a beautiful pedestrian bridge across the Tiber River, which was commissioned by Pope Sixtus IV, and it offers lovely views of the river banks and the dome of St. Peter’s Basilica. Then, we wandered to the Villa Farnesina, to get a more personal look at the sort of place that the wealthy families of the time lived in. This one was commissioned by Agostino Chigi, that personal banker of Pope Julius II. 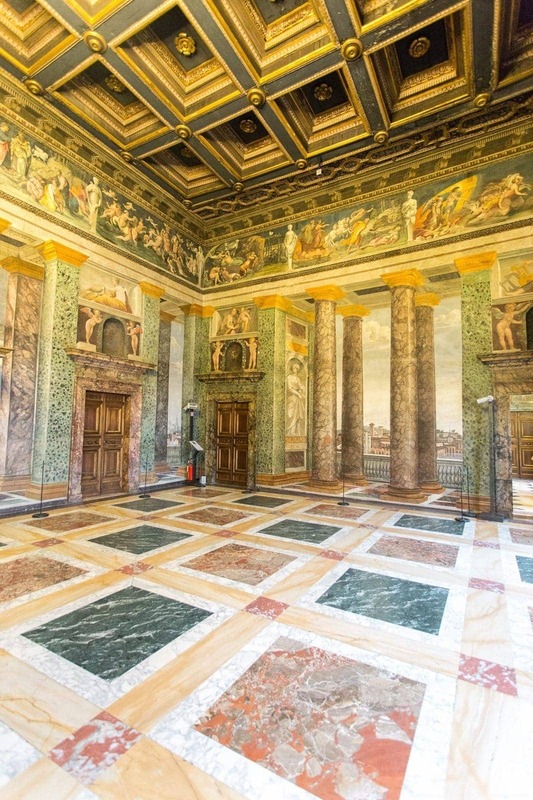 Clearly not short of a bob or two, this stunning pad is lushly decorated with frescoes by many of the great artists of the time, including Raphael. 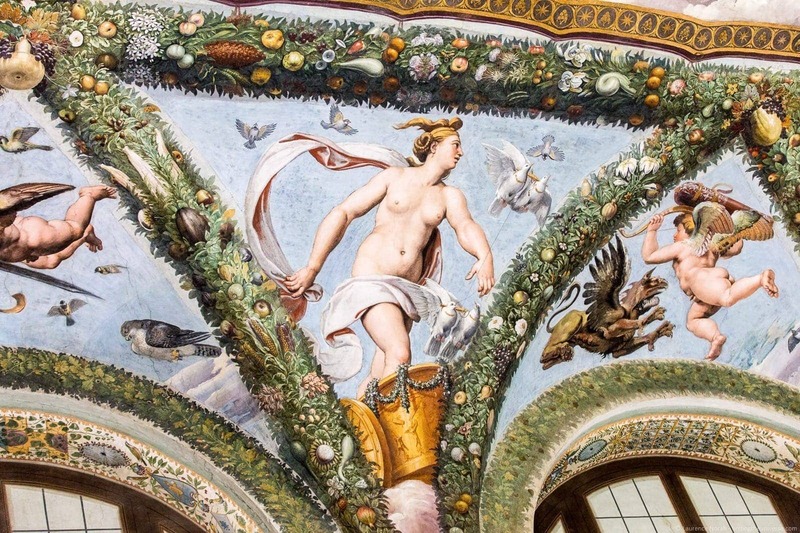 There are also some incredible frescoes on the first floor which use perspective tricks to offer a marvellous view of countryside and cityscapes. It’s hard to tell where reality ends and painting begins! After the Chigi family, the Villa became the property of the Farnese family (hence the name). As mentioned earlier in the post, these guys were seriously influential, having a pope, a cardinal, various military commanders and even the Queen of Spain amongst their ranks. This last part of the tour was really fascinating, giving us an insight into the sort of place you could live if you happened to hail from the right family tree in Renaissance Italy. Quite a nice one, as you might imagine. So what did I think of the Context Tour? I thought it was brilliant. The passion of the guide really shone through, bringing to life for me this period of Italian history, which had so much impact across the rest of Europe, and the people who made that all happen. I liked the fact that the group size was so small, and it really just felt like a wander around a city with a knowledgeable friend, who was keen to help me understand a subject about which I had very little prior knowledge. Any complaints? Well, my only real niggle about Context Tours is that they don’t typically include any entry fees as part of their tour prices. This does mean that if you are eligible for any discounts that you can take advantage of them of course, at any attractions you have to pay for, and if you don’t get to a certain site during your tour you haven’t already paid for it so there are positives to this approach – personally I like to have one price that includes everything when booking a tour. 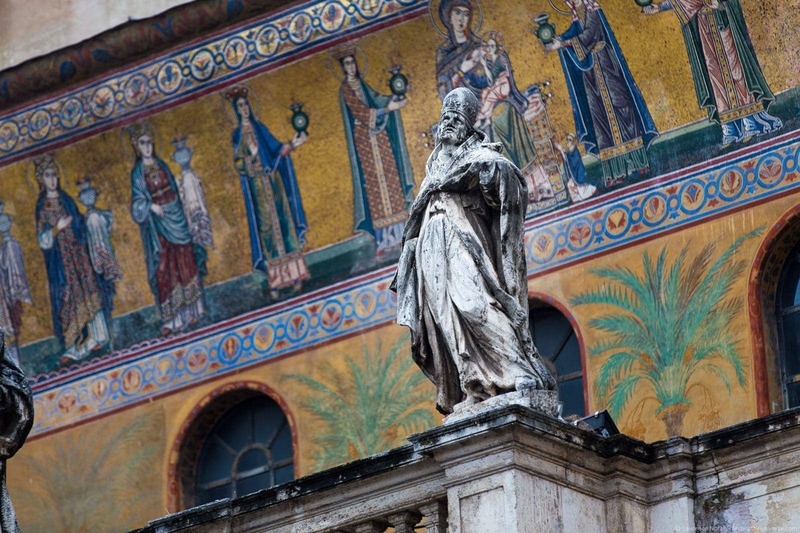 Save 10% on all Context Travel Walking Tours! After my experiences with Context Travel, I’m delighted to recommend them to you as an excellent walking tour service, particularly if you want a more personal, detailed walking tour experience. I’m even more delighted to be able to offer you a 10% discount code to all our readers for all Context Travel tours – just use this link to book, and a 10% discount will be applied at checkout automatically. This tour is a three hour tour, although our Context experience was that tours often ran a little longer than the allocated time, depending on your enthusiasm! We’ve written a number of posts and guides to visiting Rome, as well as Italy and Europe in general, that we think you will find useful. We also have a number of go-to guidebooks and other resources that we think you will find helpful for planning your time in Rome. If you are looking for more ideas for what to do in Rome, take a look at our guide to spending a day in Rome, as well as our guides to 3 Days in Rome and 2 days in Rome. These also all have practical information for your visit. 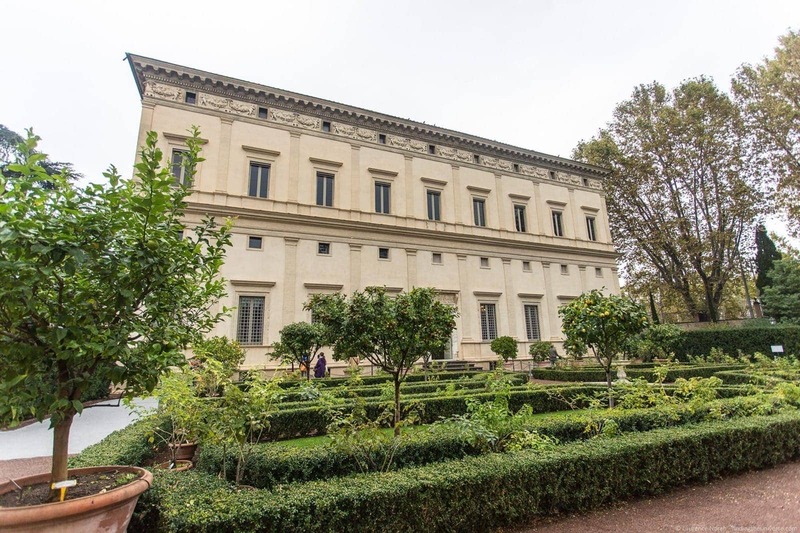 If you are particularly interested in visiting the Borghese Gallery, one of Rome’s most popular museums, we have a guide to visiting the Borghese Gallery here. And that’s it for our review of our Context tour of Rome! We hope you found it useful – as always, if you have any questions or feedback, just let us know in the comments below! So you know: We received complimentary walking tours with Context Travel in exchange for sharing our honest opinion of the walking tours, and being given a discount code to share with you. We retain 100% editorial control and all opinions remain our own. For more on how we choose who to work with, see our code of ethics.